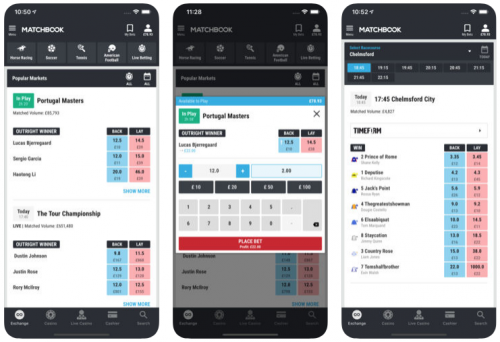 Match Book Exchange app review - Horse racing betting , back or lay? T he Matchbook exchange is an excellent alternative to Betfair and Betdaq and offers a lower commission for horse racing. There’s also ongoing offers on racing leading up to the major festivals and they recently did a 0% commission offered in the build-up to the Cheltenham festival. This is, in our opinion, a great betting app for racing trades. As well as an app on iTunes and Android there is also the Matchbook podcast which is a great listen for traders. They cover angles on major sporting events including racing and football. When it comes to the back and lay its very similar to the other exchanges for simplicity with the back in blue and the lay in pink. Placing a bet is also very simple and similar to Betfair. Tap the odds you want and then place the back or lay from the bet slip. Here’s where Matchbook is head shoulders above Betfair for the regular traders – The current liquidity is lower than Betfair so professional traders may not get matched for as much as they’d like. Standard commission (UK) – 1.7% if you take the price. The percentages include point of consumption tax in the UK and are slightly lower if you are outside the UK – 1.5% and 0.75% respectively. After securing a further investment in Matchbook in 2017 they look set to really challenge Betfairs dominance of the betting exchanges. In the last 12 months, we’ve seen liquidity grow in the markets as larger players start using the platform and hopefully this will continue to grow. Matchbook has decent offers on for new traders too, so it’s worth checking them out before joining. In 2018 they offered 0% commission on all horse racing trades in the build-up to the Cheltenham Festival and then carried this on until the end of April (Ts and Cs applied as always). In sponsorship terms, Matchbook can be seen sponsoring UK racing and even doubled the prize pot to 100K for the Imperial Cup at Sandown if any horses went on to win at the Cheltenham Festival after winning the race (Full story here). Slightly different from the normal exchange the Matchbook app also gives you access to the Colossus bets football pools. There are horse racing pools coming very soon after Colossus teamed up with major UK races courses to build a new form of pools betting for racing fans. Colossus bets have their own standalone app as well as being integrated into the Matchbook app. You can play all the pools and get the cash outs within the Matchbook site or app using your Matchbook account. Colossus bets pools are like a standard pool only supercharged! We can’t wait to see what they do for horse racing and we’ll update you as soon as they launch.